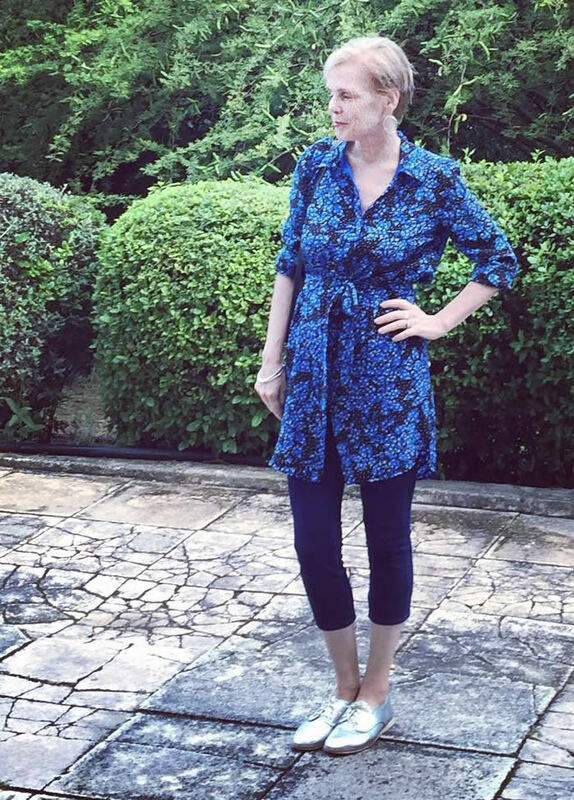 Jeans look great on many women, no matter what your age is. But in order to look stylish in them over 40 you should choose your jeans with a little more thought. 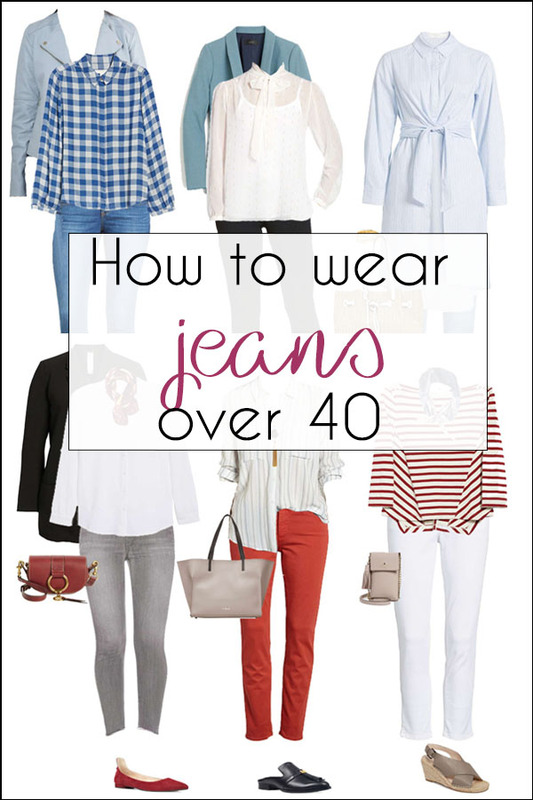 Here are some general guidelines to follow for wearing jeans after 40. This looks dressy and has the added advantage of making you look slimmer. 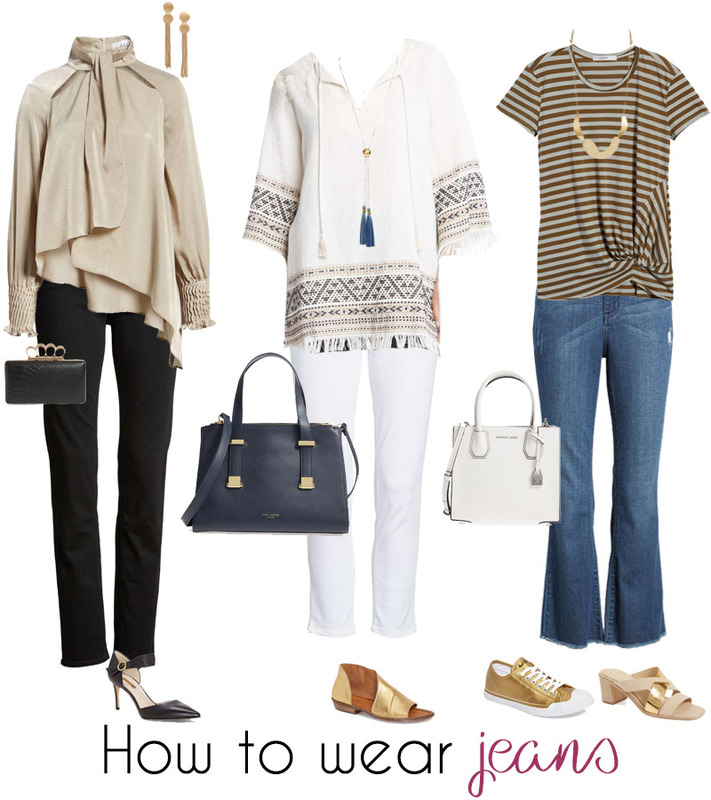 White jeans are fabulous for spring and summer and make every outfit look fresh. 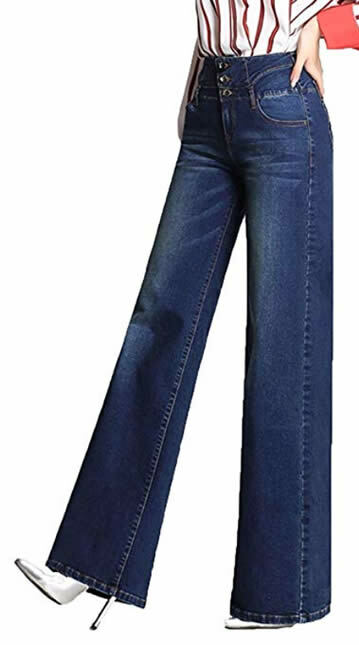 These Levis jeans are very popular on amazon and are a great basis for many outfits. I personally avoid these. Slightly darker jeans are much easier to wear with other clothes and can be worn to work too. I’ve seen many 40+ women looking great in ripped jeans but I personally avoid these too. That doesn’t means you have to go too dark. The jeans below are a great example. My personal favorite jeans at the moment are my cropped flare jeans by Paige which I wear with short cropped tops and longer tunic style tops. The ‘top’ on the left is actually a silk DVF dress which I tied in an asymmetrical way. Muffin tops over jeans are not flattering! You my want to go for jeans with a higher rise. If you get a firm stretchy fabric they will do a great job of tucking the tummy in. I love the jeggings from uniqlo that I pair with tunics or short dresses. Either tuck in your tops or wear tops big enough so they cover your stomach area. You shouldn’t have this problem if you have covered up your stomach / back area properly, but just to make sure: don’t show your g-string! These pants can give you a great shape as they highlight your waist. Make sure they fit well around the waist and hip area. It’s nice to wear high heels under them and ensure that the jeans have good length and almost touch the ground. This will really lengthen your legs. I like these ones from Minghe. I like to wear tunics and short dresses over jeggings (jeans that are leggings). 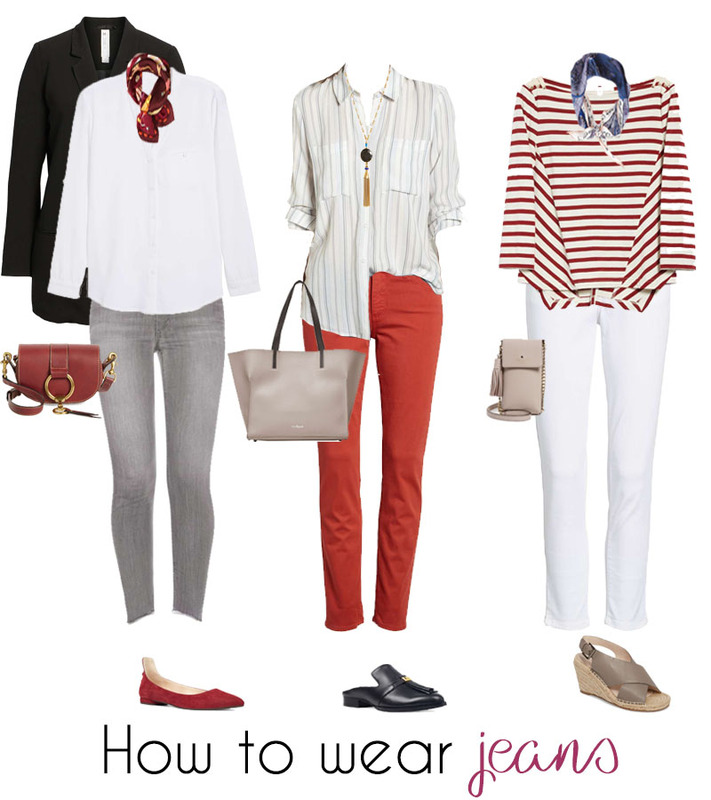 Here I’m pairing my uniqlo jeggings with a silk DVF top (mixing high and low end). Want to know more, check all my tips for wearing leggings over 40. Best to keep it reasonably simple and classy. Although denin on denim is on trend right now, embrace it with caution. Although cropped jeans can look good on many women, you need to take your proportions into account. If you have proportionally short legs, make sure you tuck in your tops or wear a cropped tops. Cropped jeans are easiest to wear when tapered and are best worn with heels. I like these ones from Lucky Brand. For more ideas check my guidelines on how to wear capris and cropped pants. 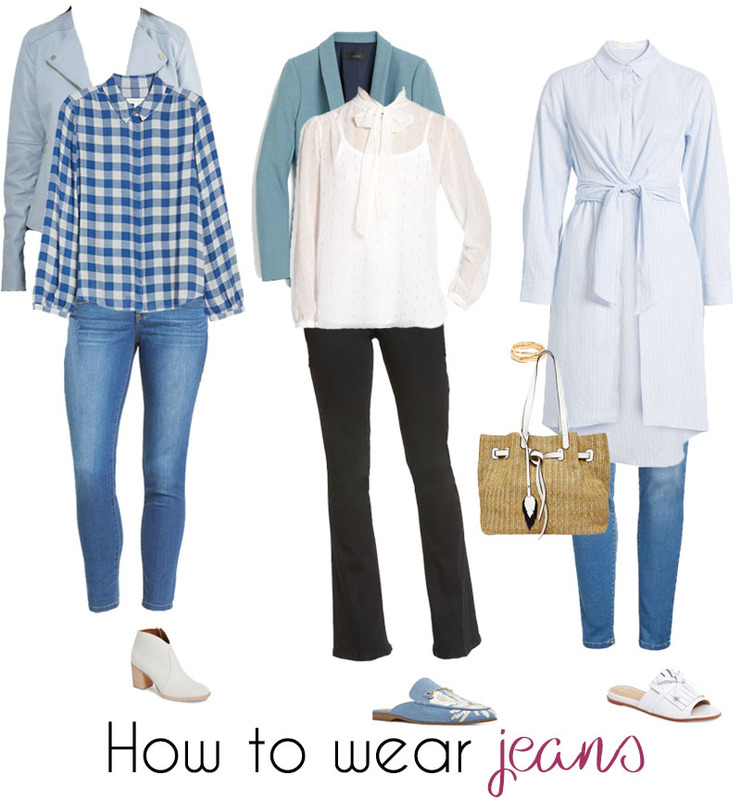 You can also roll up your straight leg jeans. Best to choose models with medium rise fitting. High rise is popular too but make sure it fits you around the tummy area. No mummy jeans please (very high jeans that’s roomy and doesn’t fit properly) as those look unflattering and will age you. 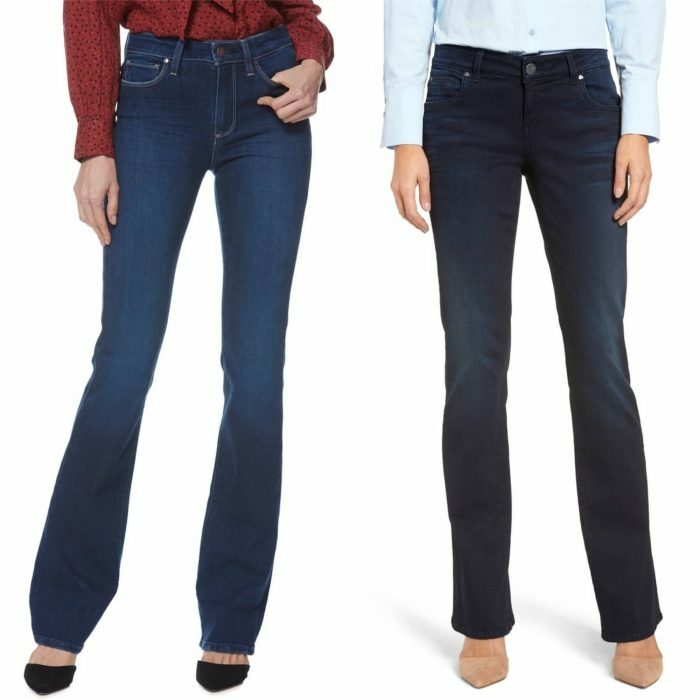 NYDJ is very popular amongst 40+ women and the below high rise jeans will suit many body types. #14 Get jeans with stretch! I like comfort so I usually opt for jeans with some stretch. They usually also fit better. Boyfriend jeans, however, are popular and can look great for casual days. You need to be able to bend in them. #17 Getting the height of your jeans is very important! When you find a pair you love, buy one to wear with flats and one to wear with heels. You may want to check our guidelines on the best lengths of pants. Bootcut jeans are flattering for most body types and can be very lengthening. Make sure they skim the ground. They look best with point shoes for a even more lengthening effect. I love my Paige denim bootcut jeans ! They fit like a glove and feel soft on the legs. Buy them long enough to wear with heels and your legs will look a mile long. I don’t love the below ones as much as they are cut too low. I would now go for at least a mid or high rise jeans. This is a high waisted pair I like right now. As always these rules are not always meant to be followed and as any stylish woman will know, you should on occasion bend and break the guidelines! What are the best brands for jeans? High qaulity jeans that’s very affordable. My personal favorite. Pricier but the jeans keep their shape and color and they feel so soft to the touch. They fit me like a glove. The true classic never goes out of style! How do you like to wear your jeans? I do have more guidlines with my jeans than I used to. I care about fit now more than I had to then. Thanks for these tips; they are great! Glad you liked them Paula! I no longer wear any lower rise jeans at all. I mean anything with a front rise of under ten inches is out completely. High rise is so much more flattering, and makes legs look much better. I don’t avoid mom jeans either. I still prefer Levi’s to any other brand. They are just far more classy. I’m certainly not going to wear any “not your daughter’s jeans”. I was totally disinterested in jeans during the Big Jeans Trend of the 2000’s, but now I’ve become re-excited by them. I’m especially into skinny jeans and colored jeans, which is weird because when skinny jeans first came out I thought they were the least flattering things I’d ever seen. (It’s not a cut for everyone and I can only hope they look as good on me as I think they do.) As a general rule I agree with your suggestions however! I love jeans! If I had to pick just one item to wear for the rest of my life it would be jeans. I have them in every shape from leggings (perfect with over the knee boots) to flares (perfect with platforms) and in many colors – even a pair of yellow ones to wear to my son’s college football games. I have them at every price point but like them all equally. I do follow most of your guidelines – no light washes (though I do wear white jeans for 3 months of the year), no muffin top or bare tummy. I don’t do crops but will roll up the legs on straight jeans to show off a pretty shoe. I am not one of those people who wear jeans everywhere – I do not wear them to parties and our country club has a complete ban on them, but I am confortable and happy in my jeans. I’ve enjoyed reading your thoughts and suggestions I like Talbots but only for business attire..
A late comment from me who has 9 pairs of jeans wearing them very often. For me the jeans of “7 for all mankind” are really good as they provide me with a bum. They used to be flared and, unfortunately, low rise, so problems with love handles. I used to wear wider, longer tops until I discovered shape wear. No love handles and…. the jeans feel much more comfortable round my stomach. And also jeans of the brand ” Not Your Daughters Jeans” (NYDJ) are great. I have to confess that I do wear cropped jeans. Very tempting when you have good legs and you want to show them off. I will take a good long look at myself one more time to see whether it is wise. Cropped pants and jeans are still very much in style and you will be able to pull those off. But it is a challenging style and on many women I prefer the ‘illusion’ and silhouette of a longer leg which can only be achieved by longer styles..
Great tips. Thanks. I’m short and not skinny. I tend to find jeans that fit and look good and then buy 5 pairs. . . all the same. Maybe I should branch out? I’d really like to try jeans which are more tapered at the ankle (and wear boots) but I always feel like those emphasize and enlarge my hips. Thoughts? Although it’s a good idea to buy multiples of jeans that are perfect, 5 seems like a lot to me. I would try other pant styles or other colours as well. You are right that more tapered jeans put more emphasis on the hips. If that is not an area you like to highlight, you may want to stay away from them. On the other hand you may just need to get used to the silhouette. You could always try a (cheap) pants and see how they make you feel? Another way to wear skinnies and tapered jeans effectively is to wear them with tunics, which is a favorite look of mine. In general though, straight or bootcut jeans tend to be more flattering on most people. The best invention South of Europe is that Levi Strauss introduced the “curve” jeans when the realized that the population down here have more buxom and more rounded hips than anywhere else in the world. The joy about the “curve” jeans is that they come in variable shapes of curve, accommodating the pear shapes and making allowances for the wider hips! I personally prefer the bootlegs as they elongate the legs, allowing high(er) heels, and giving instant height (not that I need it at 1.78m) but it does have a slimming effect. I’m from Iran and in Iran women are not free for choosing clothing. Your set is very good. Some of the models wearing the clothes you have an excellent and I can wear those in iran. Some of the tips are useful while some do not apply. It also depends upon looks. There are 40+ year olds who look older than they are and have to pay attention to some details such as baggy jeans etc. Actually, baggy jeans are not bad at all as long as they are worn smart according to the fit and to the wearer….Sharon Stone looks great in baggy jeans and she is 54 years old. Teri Hatcher is 47 years old and looks awesome in ripped jeans. But then again, not all middle aged women are in good shape. Bottomline though is that, a FIT woman can look good in anything as long as it is worn with some minor but important changes. For example, for a woman over 45 ripped jeans might look good as long as they are not too ripped and as long as she is fit and in good shape. Over weight and out of shape women, women who look frumpy and unkept in general, they have to be a lot more careful in their wardrobe choices. You are very right Odysseia. All my advice is quite general and everyone should just make their own judgement about what applies to them. Quite a few women like guidelines which is why I provide them, but I also encourage everyone to do their own thing and break any ‘rules’ or guidelines whenever they please. Wow! Why bash women who are the heavier side of things? There are a lot of reasons that women gain weight as they age. To assume that an over weight woman is frumpy and unkept is a rather rude thing for a mature woman, don’t you think? Liked your article 🙂 Just wanted to let you know that your links do not work for the jeans. Thanks for letting me know Robin. I have now corrected this and updated the page with lots more jeans you can buy right now. I feel you can wear any color after 40. I personally would keep the rest of your outfit quite neutral though. Don’t make it all over bright. A white top would look fabulous! Very interesting. The best online store for women clothes for me is http://www.missholly.com.au/jeans/ I have bought most of my clothes from there. Greetings! I simply love jeans, Its very comfortable and we can carry it in any occasions like formal, casual & so on. 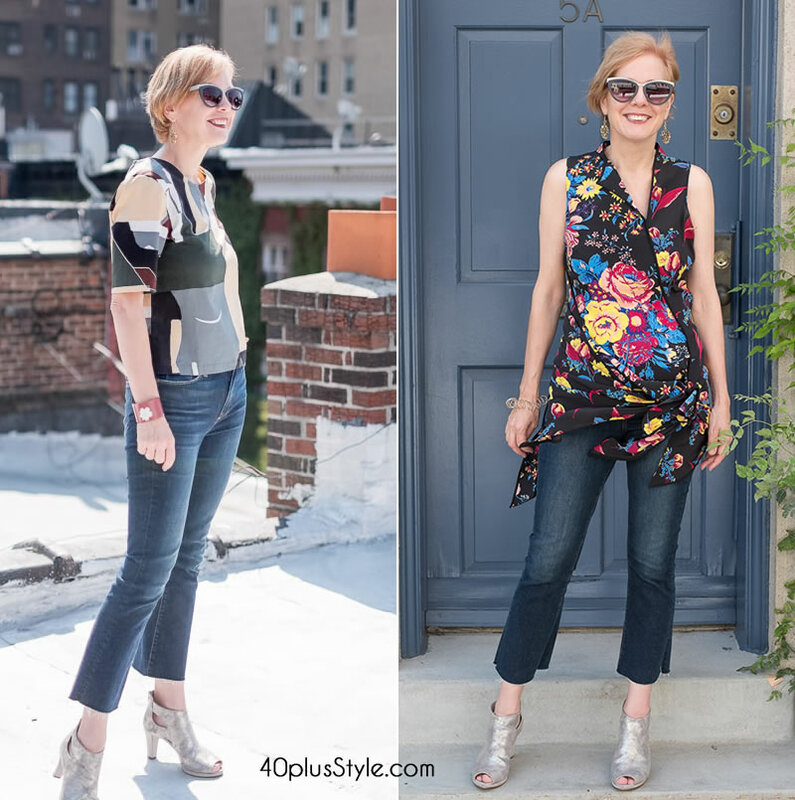 The skinny jeans are my favorite, I believe that they give a perfect look to me and carrying them is fun if you pair it with the appropriate tops, shirts or T’s. ….because of your website and the lovely women who continuously share wonderful fashion ideas, I am now back on my feet and aching to be beautiful again. Thank you so much. I am so inspired. It’s been 12 years of “hermit fashion”, so happy to find you and get out of my cave. Oh how lovely to hear that Cecilia! You may like to join my upcoming style challenge on Feb 2 to ignite your style even more. Details coming soon! Should you dress for your age, how old you feel or how old you look? I am 45 but look much younger and I feel young. Tough question Reba. I would say, dress on how you feel and trust your own instinct. In any case no matter what you wear, if you wear it with confidence, you will pull it off and look good! Just bought my first pair of rip/repaired jeans and waiting for them otherwise do not wear ripped jeans. I am 41 and in good shape but they still worry me! The rip/repair is fairly minimal and Reid Cone brand from J. Crew, hopefully they work! Otherwise I like my slim boyfriend jeans. I’m sure they look great on you Carie. My guidelines are just general and I have seen many 40+ women rocking those ripped jeans! They are very high waisted super comfortable jeans. The fit tends to be a bit baggy. They usually look very unflattering. However, a newer generation of high-rise jeans is now quite popular and when the fit is right can be a good option for 40+ women too. Good to know. I don’t think any of my jeans are mummy ones – well not in a bad way anyway! So I’ve read all kinds of iinformation on line and now I am confused. Do you have to belt jeans? It’s really up to you. It’s a personal preference. Both belted and unbelted can look great. I had bought a Hue floral legging and a red pair…I’m finding most of my tops just aren’t long enough. I’m 5’6″ and have long legs…I’m thinking of taking them back..I’m also thinking about a pair of boyfriend jeans but I have thin legs. I think I’m getting in a rut with jeans and leggings, what other pants do you recommend? It all depends on your body type and figure priorities. (please check the how to dress after 40 section). I think wider long pants may be a good option for your or 7/8 cigarette pants. It really bothers me that when you hit your 40’s that there are comments about the inability of wearing stone washed or light washed jeans. I don’t understand what is wrong with that. I no longer wear really distressed, but stone washed, why? I think if your thin and in good shape there shouldn’t be anything wrong with it. I hear you Lena and I agree with you. I like to listen to other peoples’ opinions and take them in consideration but I always make my decisions based on what I want, so same thing with stone washed jeans. They might not be recommended to wear after a certain age or whatever, but I still like them therefore I still wear them. Meaning if I like it I’ll wear it regardless, but always taking in consideration how well I can wear something and if I will be able to pull it off. Hi Lena, these are just general guidelines. I wear washed jeans as you can see in the images I shared above. And there’s certainly no ‘rule’ that says you can’t wear stonewashed or torn jeans. It really is all about attitude, the confidence in which you wear certain things. If you have those, you can wear anything. Nice update. I am very much a jeans “girl”. Love your examples. You wear them very well. I don’t wear “our” Paige flared jeans much as I have to wear them with heels and I don’t always want that. Just bought two pairs of wide trousers by Joline Jolink. I am very pleased with them. One is blue and rather sophisticated and the other one is kakhi and makes me look like “Kruimeltje” which is fine by me in my leasure time. Yes I know what you mean. I still love them though when I really want to appear super slim and tall! your contribution is worth gold. Wonderful as you have presented the different looks. Thanks for the great blog post! 4 weeks ago I have launched my own jeans collection called LADY DELUXE. It’s a jeans for women with kurves, women in life and women who like to wear jeans. 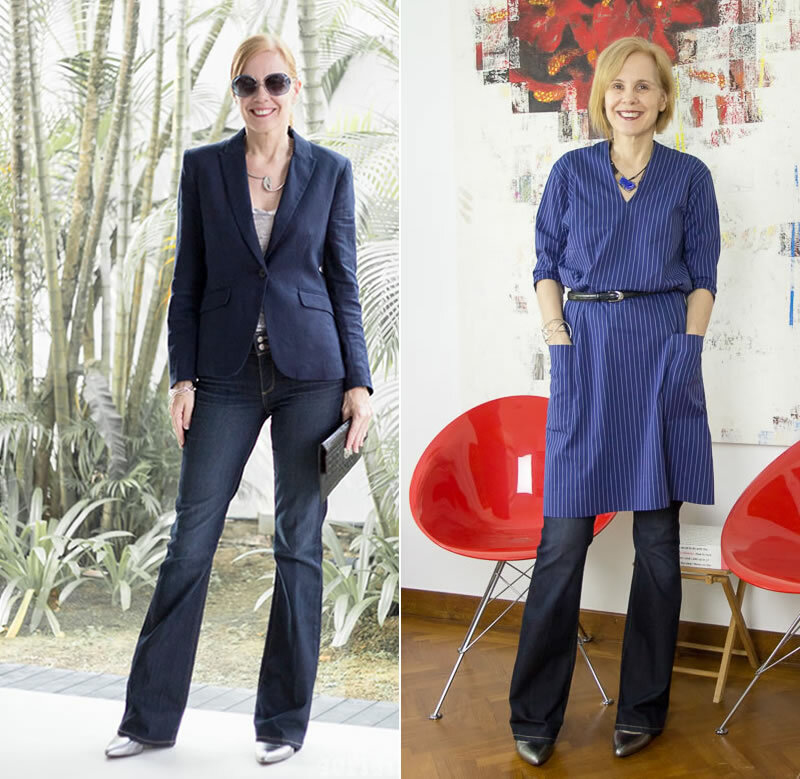 My Collection has a blue and a black Jeans – so for Business it is a wonderful possibility to wear a Lady like Jeans. Look at my blog. I hope you like my jeans collection as much as many other ladies over 40. Congrats on launching your line. Wishing you lots of success with it! This is probably a completely ridiculous question but I need answers! Belts? I own two pairs of jeans and one pair of black pants but they all need belts or they fall down and get SO droopy. Is this a fit problem? Maybe it’s time for better jeans? I have one pair on NYDJ and one pair from the Gap. Any advice would be greatly appreciated. I also need a cute belt – that will hold up my pants! Or I could just give up and get old man suspenders – haha. Not ridiculous at all Erin 🙂 It can sometimes be hard to fit jeans especially as we all have unique bodies. You can either take your jeans to a tailor or as you do, wear a belt. We’ve written a comprehensive article on how to wear belts at https://40plusstyle.com/how-to-wear-a-belt-tips-and-tricks-to-get-the-most-out-of-this-accessory/ I also encourage to try on all kinds of brands. They all fit differently and one brand may fit your body well. I personally like Paige (linked to above in the article). Yeah, I’ve completely given up on low- and even mid-rise jeans. I have an hourglass shape and find that high-rise are SO much better for me. My favorite new brand is Good American–I ADORE these jeans! Hi Catherine, Great to read you enjoy the site! The best way to create a great wardrobe on a budget is to use the concept of capsule wardrobes. You can learn more about that here. This style interview will give you some ideas and tips as well. You may also find this article useful on how to stick to a budget. I can’t wait to try wearing like. And gain all my confidence back. Previous post: 8 fashion sneaker styles to try this season – Which one is your favorite? Next post: How much should I weigh for my height and age?